I scribbled the idea for this image late one night 19th July 2016. Sometimes I really wish I could take away a friend's pain, grief or illness. 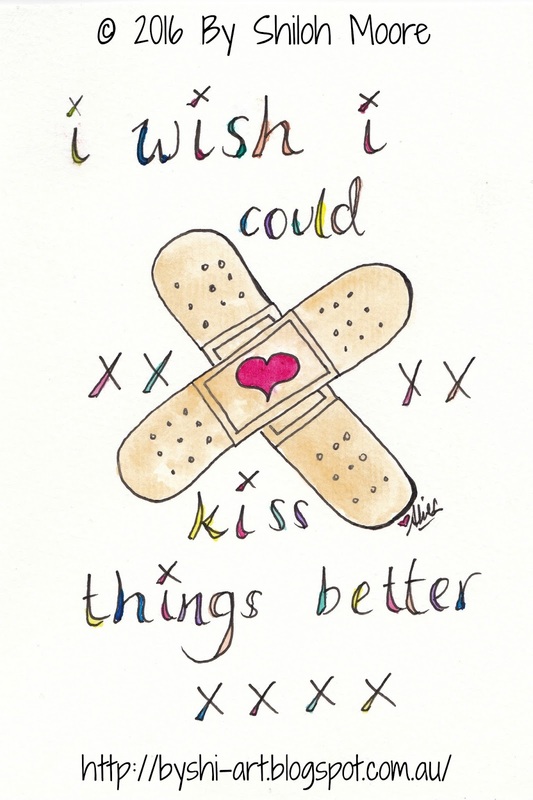 I don't like 'Get Well Soon' cards for people with long term illness or mental illness or people who are grieving, but sometimes I wish I could just kiss things better. So I made this for a card. Please enjoy the Art Work and take the message to heart. There are times in all of our lives when we know ourselves to be struggling , band aids send a message for all to see. Yet there are chronic conditions where band aids just don't do the job. Yes , we yearn to kiss it better and make everything alright . That care and love for others is such a basic human desire . We do it for our children , for those we love and care about. There are also times when a kiss does not make it better , then its time to fight and make a stand ! Chronic Conditions do not go away , the term 'chronic' simply means a 'time line ' ( a medical definition ) . Chronic does not in any way imply that a serious medical condition is any less serious in its impact , in fact - the impact is lasting , there is no ending . Bear that in mind the next time you hear the word 'chronic' used flippantly ! Thanks Andrew. I think you interpret its meaning different to its intention. 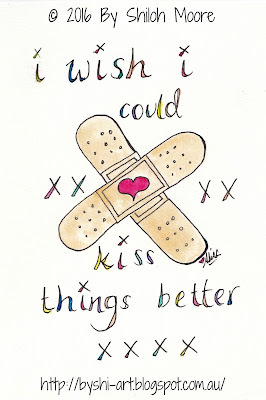 I meant more emphasis on the word 'wish' - 'I *wish* I could kiss things better (but I know I can't...)'is implied. In no way do I mean to diminish your struggle, I *wish* a bandaid was all that was needed to help and I am frustrated it can't!